My grandmother often made cream of wheat when I was a little girl and I loved eating it, topped simply with a sprinkle of brown sugar. Quinoa flakes offer a modern spin on that tasty breakfast with a gluten-free grain that cooks in two quick minutes. It takes almost as long to pour cereal from a box…Well, maybe that is quicker and we certainly do that sometimes, but this option is warm, comforting and has just one ingredient on the label! Compared to the old days when I topped hot cereals with brown sugar alone, now I load on the toppings. I almost always stir in half a chopped banana for added sweetness and heft. Berries or peaches, when in season, are favorites. And, always, slivered almonds for crunch. (I toast a large amount of almonds at once and store in an airtight container in the fridge.) During the colder months, I like to take about a third of a cup of frozen blueberries, warm them in a small dish in the microwave, then pour over the finished hot cereal. The extra juice that develops as the berries thaw is a tasty bonus. If you have ever eaten cream of wheat or farina, the texture of quinoa flakes is much the same with the slightly nutty flavor quinoa is known for. 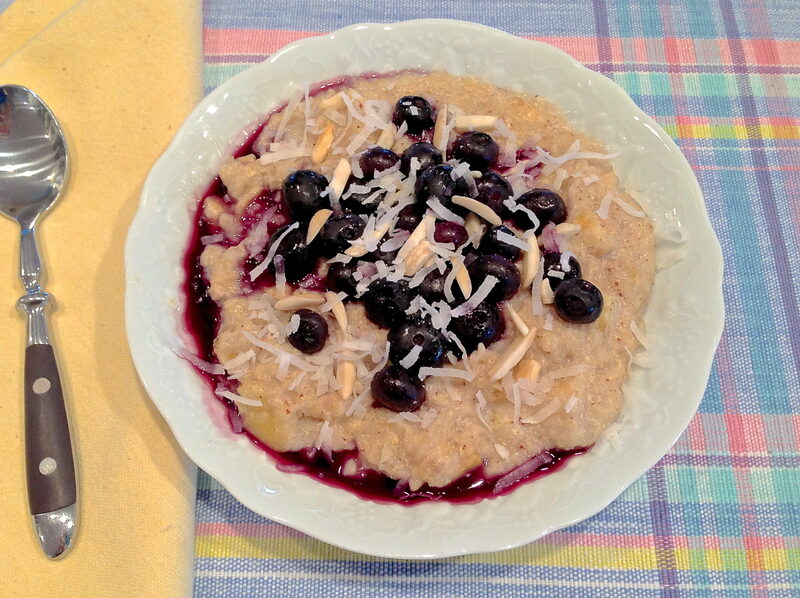 I include my favorite ways to dress up this quick-cooking breakfast in the recipe below. I do think that a dusting of sea salt adds the perfect finishing touch and allows a little bit of your favorite sweetener to shine. So you know what to look for if this is a new idea for you, I took a photo of the box, shown below. 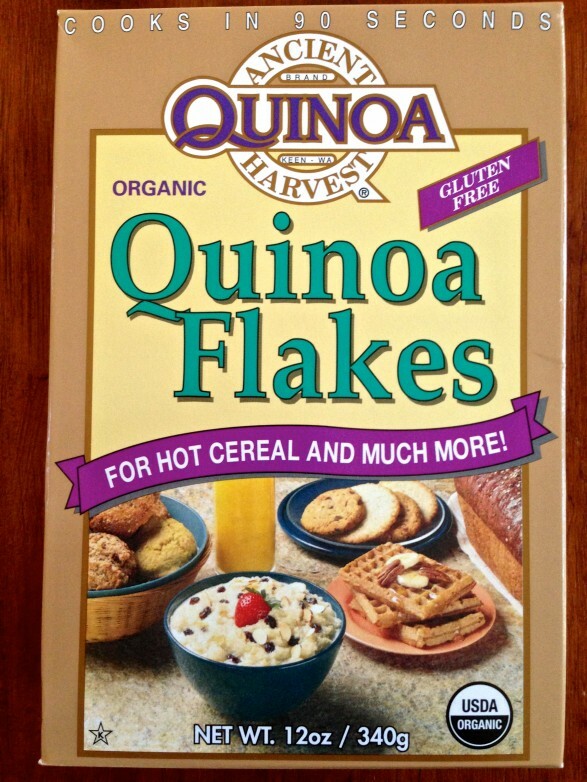 So you know what you are looking for…you can find these quinoa flakes, or a similar brand, in the organic or gluten-free aisle of most large grocery stores and many smaller markets. One of my favorite combinations is cooking the quinoa in coconut milk and then topping with berries, coconut and toasted almonds. I chop half a banana and stir it into the quinoa during the last 30 seconds of cooking. It offers natural sweetness and a bit more heft to my morning meal. A pinch or two of sea salt and a drizzle or sprinkle of your favorite sweetener finishes this bowl off perfectly! Bring the milk and the cinnamon to a simmer in a small saucepan. Add the quinoa flakes, and then reduce the heat to low. Cook for two minutes or until thickened, adding a little extra milk to thin according to personal preference. Scoop into a bowl and top as desired. I’m going to have to look for this! Thank you so much for posting it! You are welcome, Sara! Hope you discover a quick-cooking new breakfast option! Thanks so much for your response! I’ll be buying a box soon and trying this recipe! My pleasure, Betty! I hope it helped and I hope you enjoy! Just found my breakfast! I had seen this on your site and went looking for it. Going to fix this morning since I am off work today and have time to be leisurely. Have a lovely day Ann! This is one of those breakfasts that has grown on me over time and reminds me of the cream of wheat my grandmother used to fix, only with that subtle, nutty quinoa flavor. I hope you enjoyed your bowl. It’s quick and easy, too, which is always a help!